Football has long been a national obsession in Haiti, and following the devastating 2010 earthquake, which spurred the creation of a national disabled team, the country is now dreaming of World Cup glory. A 15-member squad is in the midst of intense training for the Amputee World Cup set to take place in Mexico from Oct 24 to Nov 6, far from the media frenzy generated by the World Cup for able-bodied footballers. "We won against the United States at the Copa America, and we also beat Germany, Italy and Russia," coach Pierre Rochenel said. "Since we need seven players for a game, and it's on a smaller field, amputee football is very demanding technically." 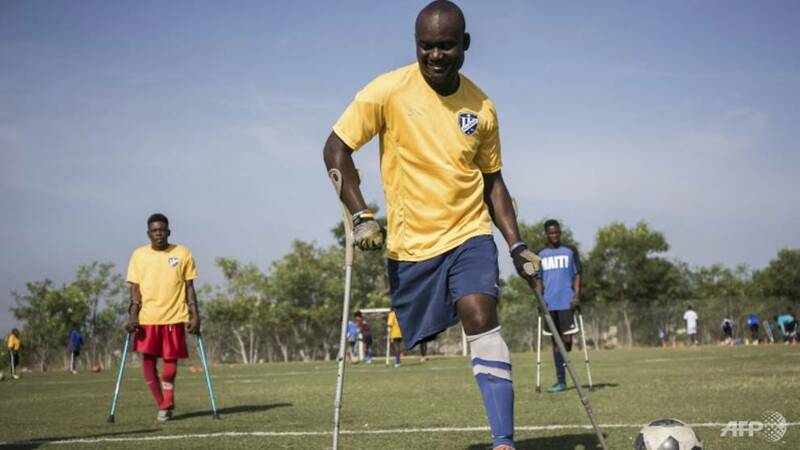 The team's participation in the World Cup next month is the latest chapter in the rise of amputee football in Haiti, which accelerated in the aftermath of the 2010 earthquake that left 200,000 people dead. Of a further 300,000 people wounded, 4,000 were amputees. Eight members of the Haiti team heading to Mexico are amputees resulting from the earthquake. Haiti's national amputee football association was launched to help motivate the wounded, many of whom became one-legged, as they faced harsh stigmatization in society. "Here, people still hide at home their loved ones who are disabled," said association president Ariel Valembrun, himself an arm amputee. "But when they see the team out in the field, people can't get over themselves. Everywhere we go, the public applauds and sees that what we are doing is good for the disabled community." "People think about the efforts they need to make to play soccer well, so when they see me, a disabled man, they can't believe it," Israel said. "I had enough of people's stares in the street, but when everyone is looking at me on the field, I feel proud. It really makes me want to live more." Beyond disabled rights, the amputee players hope to promote equality among all citizens. Among the 47 countries with an amputee football team, only two have a group of female players: Haiti and Mexico. Marie-Sophonie Louis is incredibly proud that his country, still dominated by a macho culture, is for once ahead of the game on the world stage. "We have very few able-bodied women play football here," said the volunteer who trains the women's amputee football team. "Ninety percent of our players were victims of the January 12 earthquake. It's a powerful message for all able-bodied women here and abroad: why fall back? You can do a lot and nothing is impossible." All the players and members of the amputee football association show as much motivation as their technical and financial support is scarce. "We have a few private partners, media that back us, but nothing from the state," said Valembrun, who is temporarily sharing his modest home with 18 players as they prepare for the competition. The team and its staff are only asking the minimum: a bus to travel to the stadium on the other side of the capital and doing everything so that all the players have their passports in time. Israel rolls his eyes when he hears talk of integration. "We are not on the fringes of society," said the young player, who dreams of holding the winner's cup in his hands in Mexico. "Yes, some people have deficiencies, but it's the stares and the behavior of others that makes them disabled."